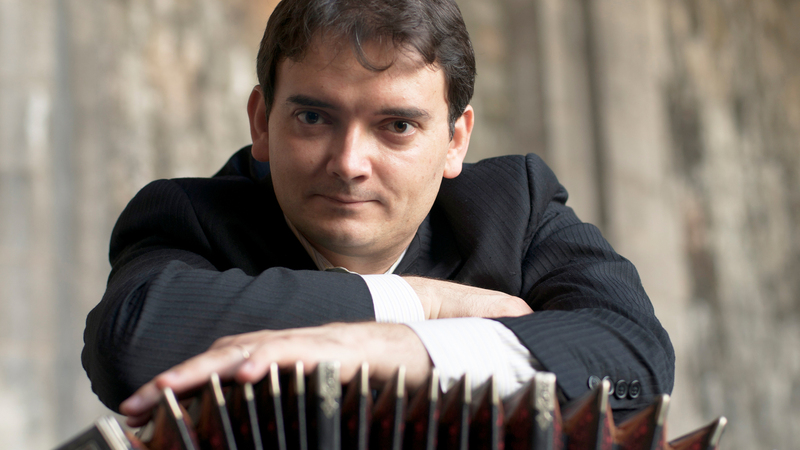 Praised by The New York Times as a “splendid player,” Argentinean bandoneonist Héctor Del Curto’s career, spanning for more than twenty–five years, has encompassed the traditional Tango, New Tango, Jazz, Classical and World music. Praised by The New York Times as a “splendid player,” Argentinean bandoneonist Héctor Del Curto’s career, spanning for more than twenty–five years, has encompassed the traditional Tango, New Tango, Jazz, Classical and World music. As one of the most sought–after bandoneonist, he has performed with luminaries across many musical genres including the Tango legends, Astor Piazzolla and Osvaldo Pugliese, latin jazz giant Paquito D’Rivera, jazz violinst Regina Carter, saxophonist Joe Lovano, violinist Cho–Liang Lin and appeared with prestigious orchestras such as Metropolitan Opera Orchestra, St Louis Symphony Orchestra, National Symphony Orchestra, Orpheus Chamber Orchestra, Rochester Philharmonic Orchestra, Mobile Symphony and Buenos Aires Symphony Orchestra. Born into a family of bandoneon players, Mr. Del Curto was introduced to the world of Tango and bandoneon by his grandfather, Héctor Cristobal. By the age of 17, he had won the title “Best Bandoneon Player Under 25” in Argentina, and was invited to join the orchestra of the legendary Osvaldo Pugliese, the “Last Giant of Tango.” In 1999, Mr. Del Curto received the Golden Note Award from the Italian–American Network in recognition of his artistic achievements. As a music director, he directed the spectacular show Forever Tango on Broadway and founded the Eternal Tango Orchestra, a ten piece ensemble. Since the Lincoln Center début in 2003, the Eternal Tango Orchestra (now the Hector Del Curto Tango Orchestra) returned to Lincoln Center for three more engagements and performed at other various venues including the Skirball Center for Performing Arts. A musician who is dedicated to the education, outreach and preservation of tango music, Mr. Del Curto founded the Stowe Tango Music Festival, the premier tango music festival in the United States, noted both for its unique series of performances and its high level of musical training. As the festival’s Artistic Director, he directs the Stowe Tango Music Festival Orchestra, a 20 plus piece tango orchestra comprised of an extraordinary group of selected students from all over the globe and world-class artists including guest tango legends from Argentina. He appears in numerous recordings with artists such as Osvaldo Pugliese and Astor Piazzolla on Finally Together (Lucho), Pablo Ziegler on the albums Asphalto, Quintet for the New Tango (BMG), and Tango & All That Jazz, Paquito D’Rivera on Funk Tango, Jazz Clazz and Panamericana Suite Tito Puente and Eddie Palmieri on Masterpiece, Plácido Domingo’s Encanto del Mar (Sony Classical), Erwin Schrott on Rojotango(Sony Classical), Denyce Graves’ The Lost Days (BMG), Absolute Ensemble on Bach Reinvented (Sony Classical), Fernando Otero on Plan, Vital and Pagina de Buenos Aires, Ricardo Arjona’s Quién Dijo Ayer and Santo Pecado (Sony International), and Shakira’s Laundry Service.